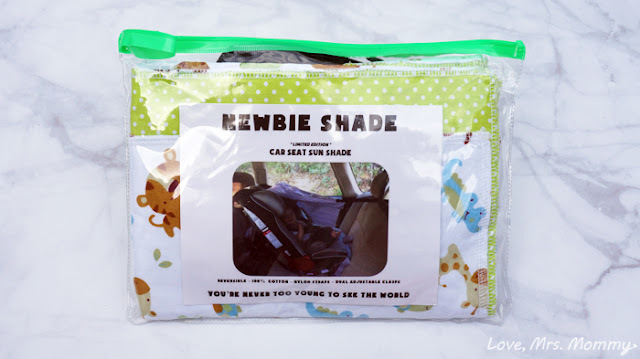 Love, Mrs. Mommy: Traveling With Your Baby Is More Comfortable And Fun With Newbie Shade! Traveling With Your Baby Is More Comfortable And Fun With Newbie Shade! I received a Newbie Shade at no cost to facilitate this review. All opinions are my own. Ever been on a long car ride and been blinded by the sun? It’s uncomfortable and if you are driving it can be quite nerve-racking. Visors don’t seem to cut-it as they are almost always just a little too short or too high to be able to block the sun properly. Not only do we need shade, but our little travelers do too! 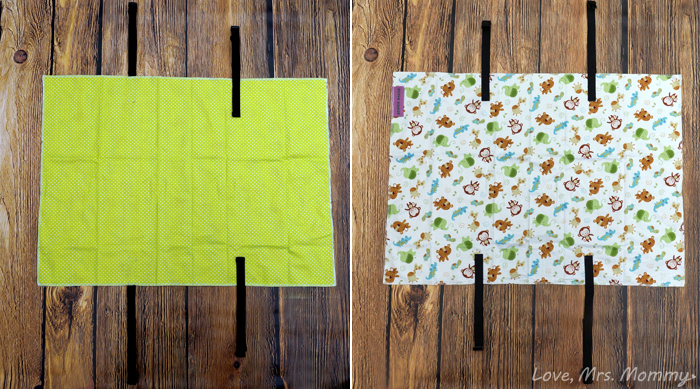 I am excited to partner with Newbie Shade to tell you all about their adorably helpful product! Traveling and running errands on a bright, sunny day can make for unhappy little travelers. With the sun making them turn their heads and close their eyes, they can’t enjoy their outing or the scenery around them. Plus, when they are super little, they can’t do much to protect themselves and that’s where Newbie Shade comes to the rescue! With Newbie Shade’s super simple set-up, you will be ready to head out on the road in no-time! All you need to do is fasten the buckles around the front and back headrest and you are good to go. That’s right, that’s all there is to it! The buckles are adjustable and can be extended or shorted as needed. There are so many adorable patterns to choose from, it will be hard to decide which one to get! They have gender neutral, girl and boy styles. I love how some of the styles have a different pattern on each side. So cute! I chose to review the Green with White Dots/Animals shade, as my daughter loves animals! With all those happy little faces staring at her, how could she not be happy?! After setting it up and placing her inside her car seat, I knew I made the right choice! She loves all the happy little animals! She points at them and tells me what they are. It’s adorable! So not only is she shaded and happy while out and about, but she loves her new car seat friends. A winning combination! Connect: Find out more about Newbie Shade by visiting their website, then make sure you “like” them on Facebook and follow them on Instagram. Buy It: You can purchase the Newbie Shade on their website. Win It: *3* lucky readers are going to win a Newbie Shade of their choice! This giveaway starts August 29th, right here at LoveMrsMommy.com and is open to worldwide entries!! I love this! It's so great for those long car trips. My baby tends to wake up easily from the light. This would be wonderful for my grandbabies, I hate driving and seeing them always have the sun in their eyes. What a great product! So many people could use this. Omgosh what a great idea!! I hate the window cling ones!! Such a pain!! I wish I would have had one or more of these when our 5 were little. Hopefully we get one for our grandbaby on the way. It looks like your little cutie pie is loving the adorable animals print too, Awww. Sweet Photos! What a great idea! And cute patterns! I have never seen one of these. 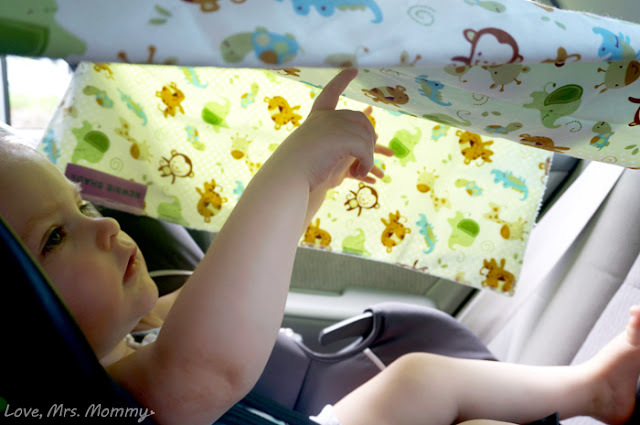 Such a great idea, my nephew would cry every time the sun was in his eyes in the car. Love the cute designs for baby to look at. We are often traveling in the evening, and the sun is usually shining in my baby's face, so this would be great for us! this is good for the baby. Great product. It's so great for those long cars trips. This looks like a nice product to use with a baby.